I've always wondered about the magical flavour combinations that make up chow mein. 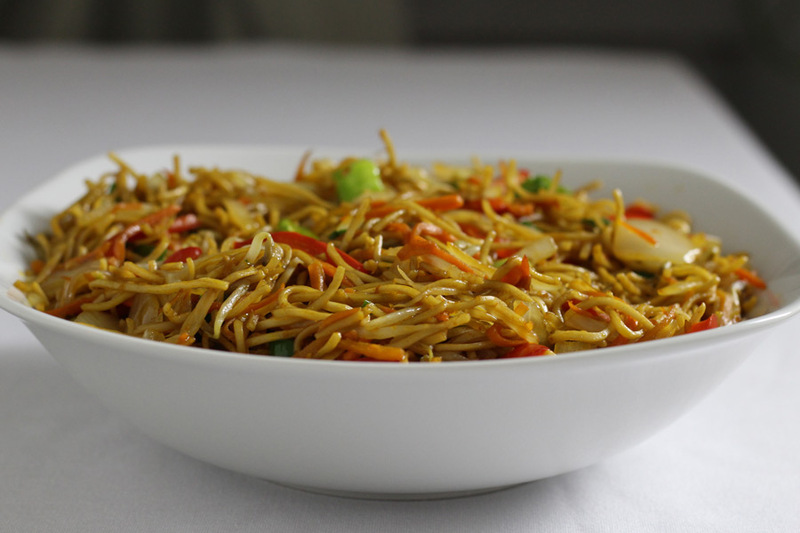 When I see it in restaurants here, it's often a very simple noodle dish with nothing but bean sprouts and green onions as accompaniment. 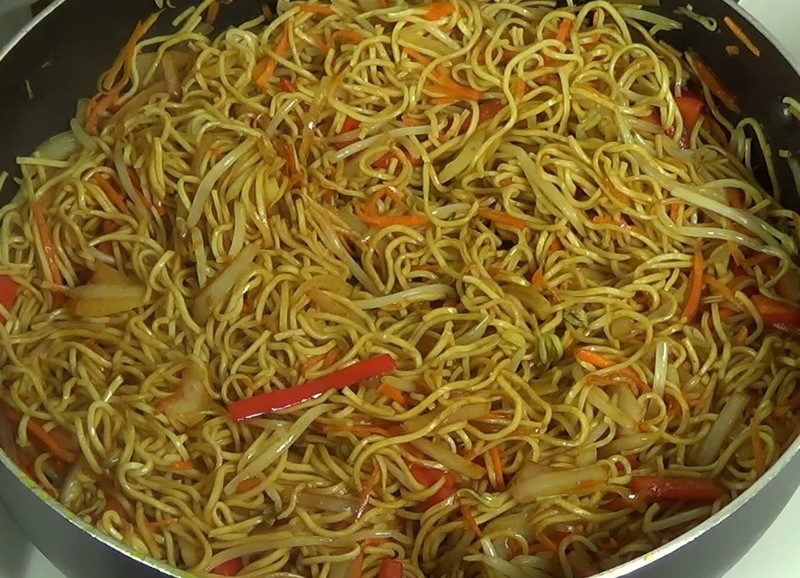 But whenever I've had it, there's always been this mysterious synergy going on between the noodles the sauce, which I've never been able to duplicate at home. Well, the internet has satisfied my curiosity and my appetite at the same time. Again. 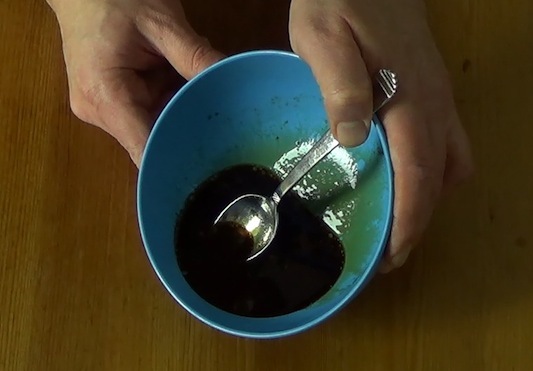 Did you know there's a dark soy sauce that's less salty, thicker and more complex than regular light soy sauce? I didn't. 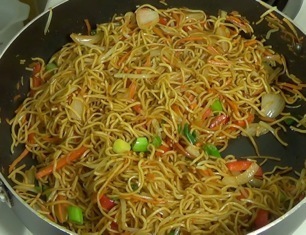 I first read about it in this recipe for Soy Sauce Fried Noodles. 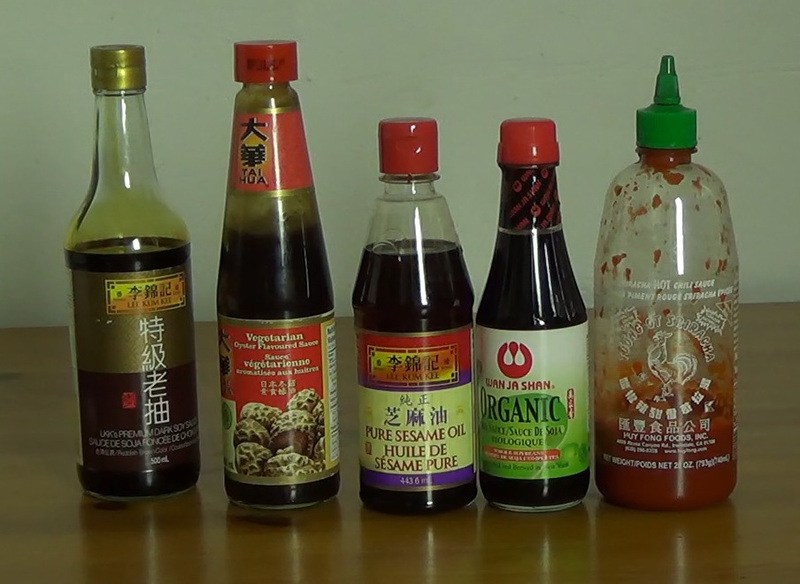 Finding some of this magical stuff required a trip to Chinatown and a long wander down the dizzying aisle of sauces. It also required a couple of attempts because I wasn't a huge fan of my first choice. I was glad I didn't settle because the brand I chose the second time was astonishingly delcious. That brand is Lee Kum Kee Premium Dark Soy Sauce. Lee Kum Kee sauces seem to be readily available in most Asian grocery stores here. 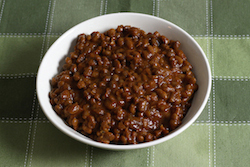 I also found a vegetarian oyster sauce that has equal parts savoury, sweet and spicy. 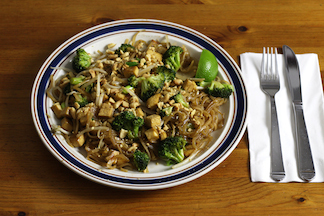 It definitely adds depth to the dish. 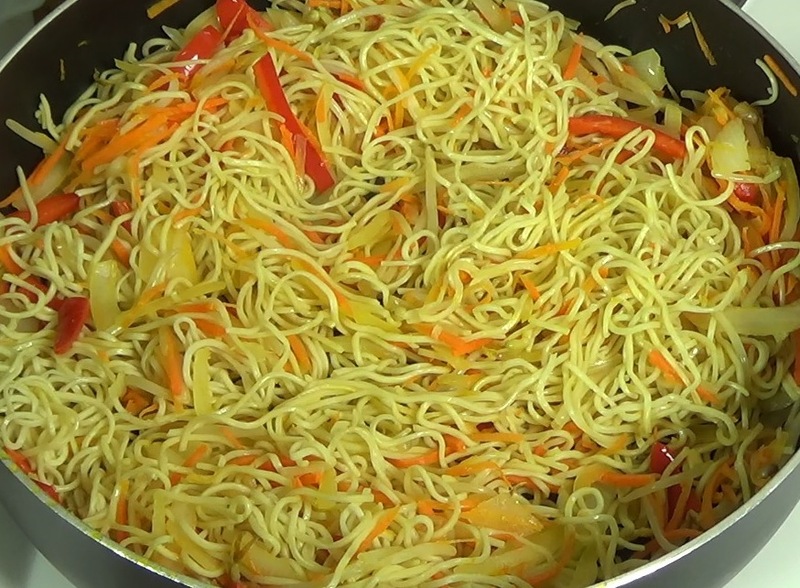 Add in some sriracha sauce for heat, some tamari sauce for saltiness and a touch of sesame oil (less is more for me) and you've got yourself a delicious noodle sauce. The vegan chow mein noodles may or may not be difficult to find. I had no trouble at the regular Western grocery store. These are just made from flour and water but they have about 11 g of protein per quarter pound serving. Not too bad at all. With the sauce and the noodles nailed down, the only thing left to choose is vegetables. You have lots of latitude here. I use about 100 g of bean sprouts for 220 g of noodles, which seems like a good balance to me. You may like more or less. And you pretty much have to chop up a couple of green onions to toss in at the very end. Other than those two expected elements, the sky is the limit. 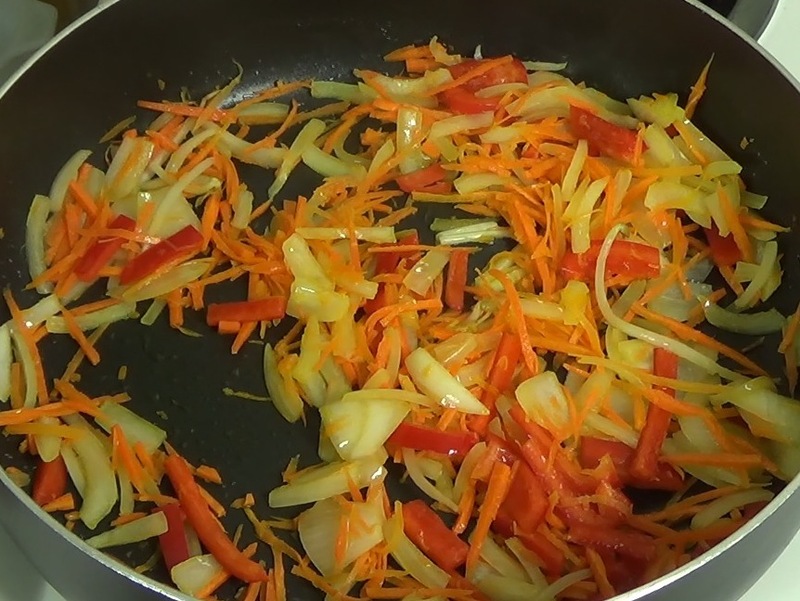 I like sweet vegetables like red peppers, shredded carrot and thinly sliced onion because I find they contrast with the salty spiciness of the sauce. 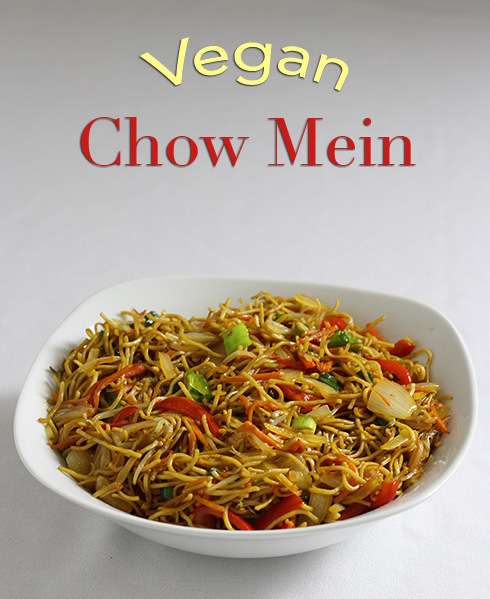 I've seen lots of other combinations of veggies in chow mein recipes. Go nuts with all your favourite greenery. The recipe below makes two good-sized main dish servings or four side dish servings. Mix the sauce ingredients in a small bowl and set aside. 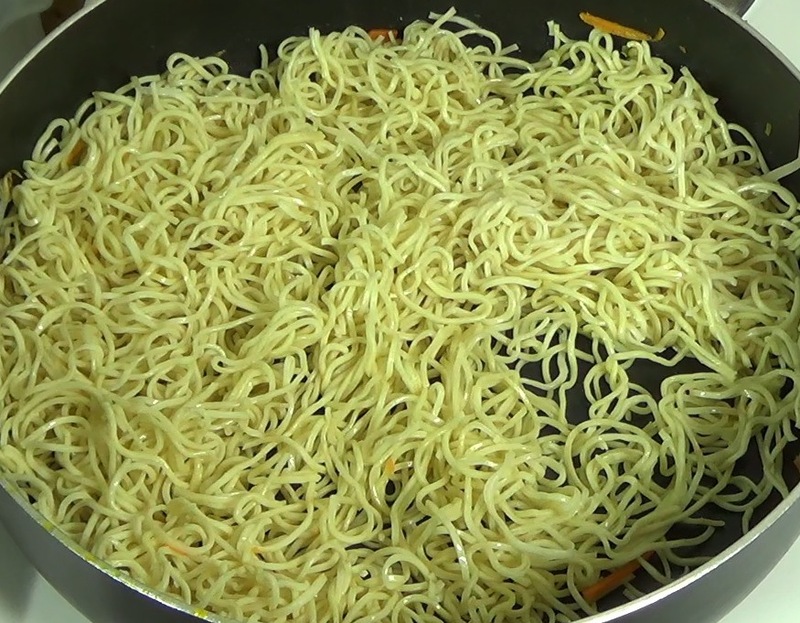 Put a large pot of water on to boil. 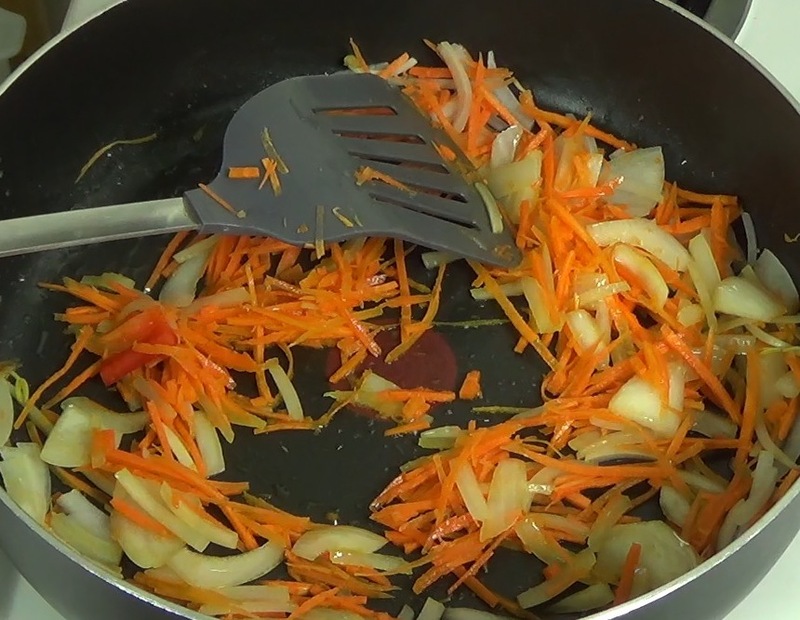 While the water is getting ready, chop up the vegetables. 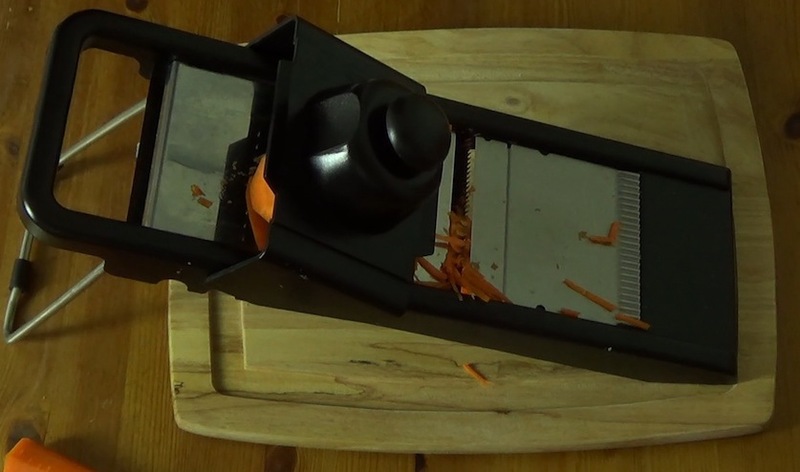 I use a mandoline to shred the carrot. The onions and peppers are sliced in the usual way, and the bean sprouts are rinsed and patted dry. 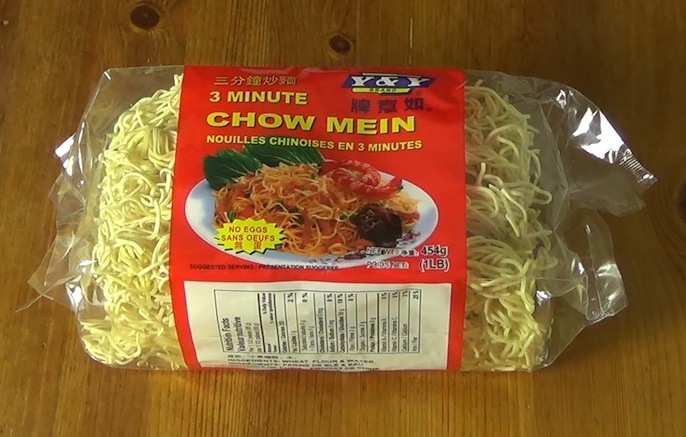 Prepare the noodles according to the package directions. 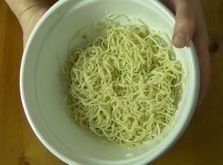 While the noodles are cooking, get out a large bowl and put 2 Tbl canola oil in the bottom. 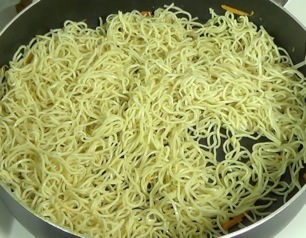 Strain the noodles then add them to the bowl and mix well so they are coated with oil. 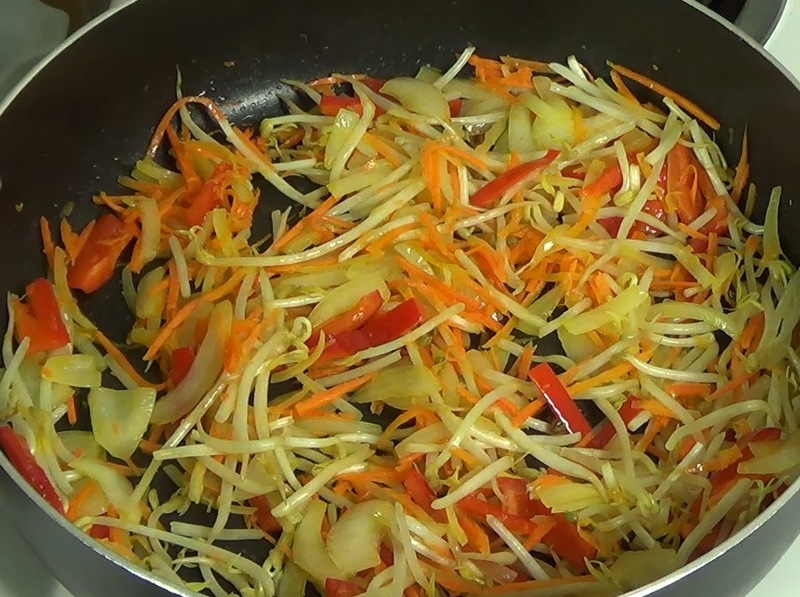 Heat up a wok or a deep skillet over medium-high heat and add the remaining 1 Tbl canola oil. Stir fry the onion for a few minutes until slightly transparent but not soft. Next, add the shredded carrot and stir fry a couple minutes more. 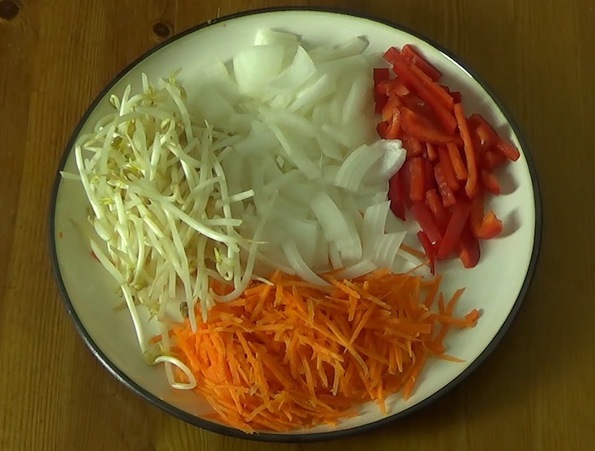 Do the same with the red pepper. And finally, add the beansprouts for about a minute. 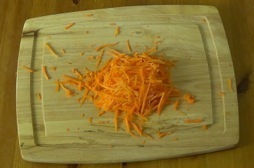 Transfer the vegetables to a plate and set aside. 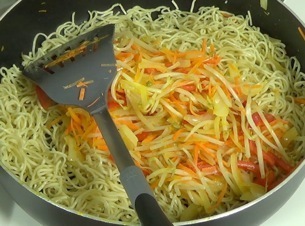 Stir-fry the noodles for a few minutes by themselves, mixing constantly. 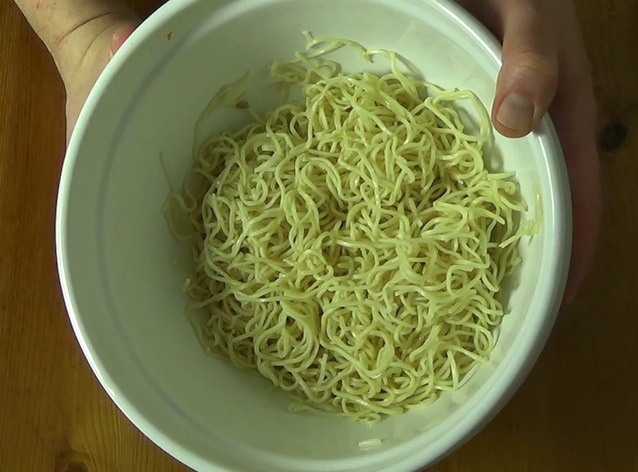 Pour in the bowl of sauce, and mix again. Continue mixing until all of the liquid in the sauce has evaporated and the dish starts to fry again. 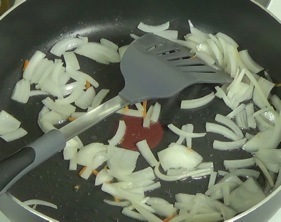 Add the chopped green onion at the end, and sprinkle toasted sesame seeds if desired. 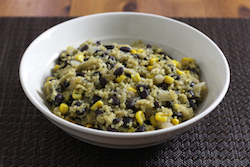 Transfer to a serving bowl and dig in! 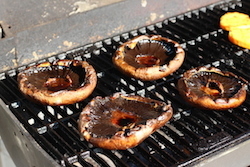 Don't forget to sprinkle with your favourite hot sauce. Want more like this? Please subscribe via the RSS Feed so you can read new posts on your favourite news reader. Copyright © 2013 ideacruncher.com, all rights reserved.